Finding a Paris bookstore when you visit this romantic city? Don’t worry, we understand that you don’t want to be cramped in the Shakespeare and Co. Paris bookstore with all the other tourists from across the globe. If you are a bookworm/ book lover looking for shopping in the bookstore with more characteristics that locals go to, follow INSIDR to our favorite addresses for Paris bookstore! Staying in Paris for a certain period of time and need to read something in English? Does the famous Shakespeare & Co. packed with tourists put you off? Stroll along the Odéon area and you’ll find this hidden gem: they sell second-hand English books and the bookstore is just so cosy! You’ll find yourself indulging among the vintage books, or talk to the very friendly staff for recommendations. Don’t forget to say hello to the very cute cat in the bookshop! This beautifully decorated vintage Paris bookstore is situated at the Galerie Vivienne; not only is it attractive for its quaint aura but also it’s a great place to hunt for some old books or hard-covered books to bring home with. Their outdoor collection is easily sorted by alphabets, with some great postcard stands that you can pick some cute cards to send to your beloved ones. Buy a book and enjoy some perfect French wine at Legrand wine cellar just next-door, like a local Parisian! Art-lover? You must visit the Paris bookstore of Yvon Lambert ! 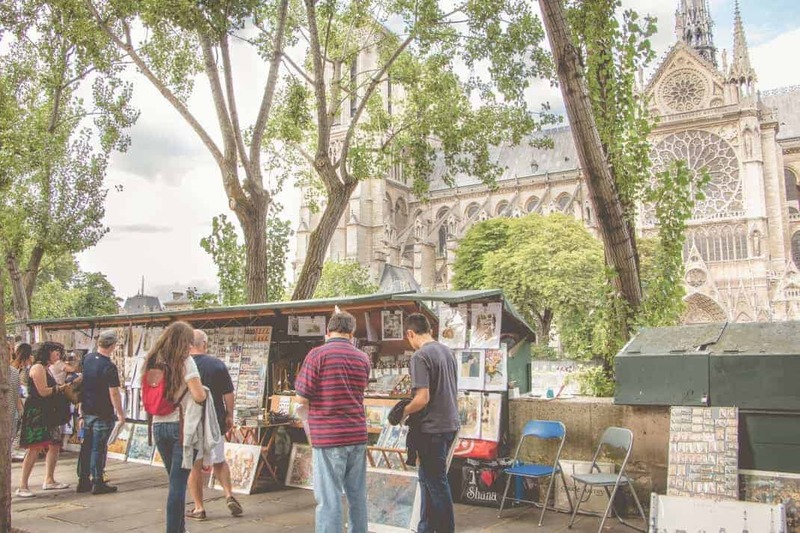 Conveniently located in the Marais district, it sells contemporary art books in both English, French or even Japanese, with a great variety of arts from the Western word as well as the Eastern. You are guaranteed to find some art books that are playful, beautiful and funny. The shopkeeper is very knowledgeable in contemporary art, you can talk to him and find out more about what’s happening in today’s art scene. There is also a room dedicated to exhibitions from different artists, definitely a favorite place of Parisians who are chic and trendy. If your French level is good enough for lots of reading, this Paris bookstore will surely be your paradise! The whole shop just sells used books at incredibly cheap price from 1€ or 2€ to even a couple of cents. You’ll always find French people spending the whole afternoon here having their head buried among the books! What a fulfillment taking home a bunch of books with such a low price! If you’re also looking for bargains but brand-new books, this is an excellent place for books at a very reduced price. Find a multitude of completely new fine art books with extremely cheap prices, and you’ll realise it’s hard to leave the store with empty hands. You’ll definitely find gift ideas for your friends and family! This librairie is perfect for those who are in love with contemporary & modern art, architecture, photography, graphic designs, cinema, sculptures and so much more! The Centre Pompidou has always been the symbol of avant-gardism and the pioneer, so is its bookstore. You’ll no doubt find a book that intrigues you here. Founded in 1700, Delamain is the oldest Paris bookstore. If you’re visiting Louvre, this is just a stone’s throw! They host a wide selectofn on literature and intellectual books, as well as books that are about Paris. Besides, they sell interesting comic books and extend their Paris bookshop to the street from June to September. What else would be a better way to get to understand the French culture? Good news for foodies and those who loving cooking! You should visit this popular bookstore dedicated to culinary books. They have an exhaustive collection of cookbooks giving you inspirations on recipes, French & international cuisines, baking, gastronomy, wines and spirits. 8 Best Cherry Blossom Paris Places! Spring in Full Bloom!